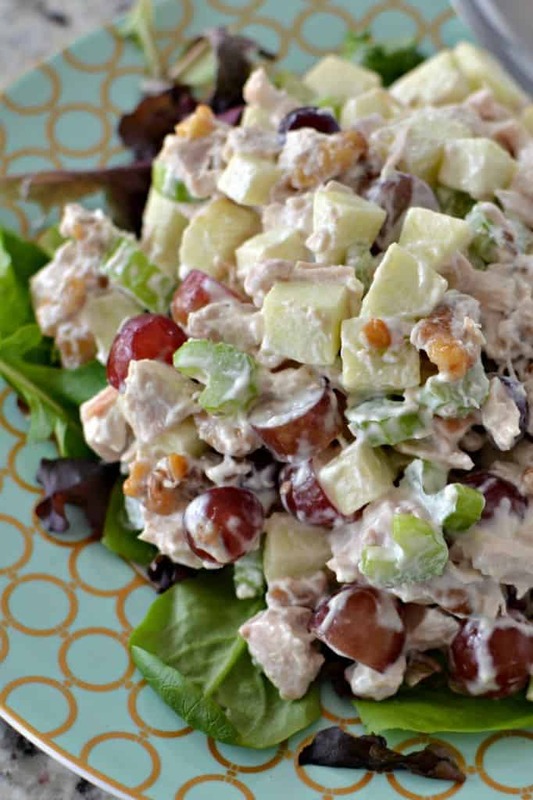 Chicken Waldorf Salad is tender chunks of chicken mixed with celery, grapes, apples, toasted walnuts and mayonnaise. 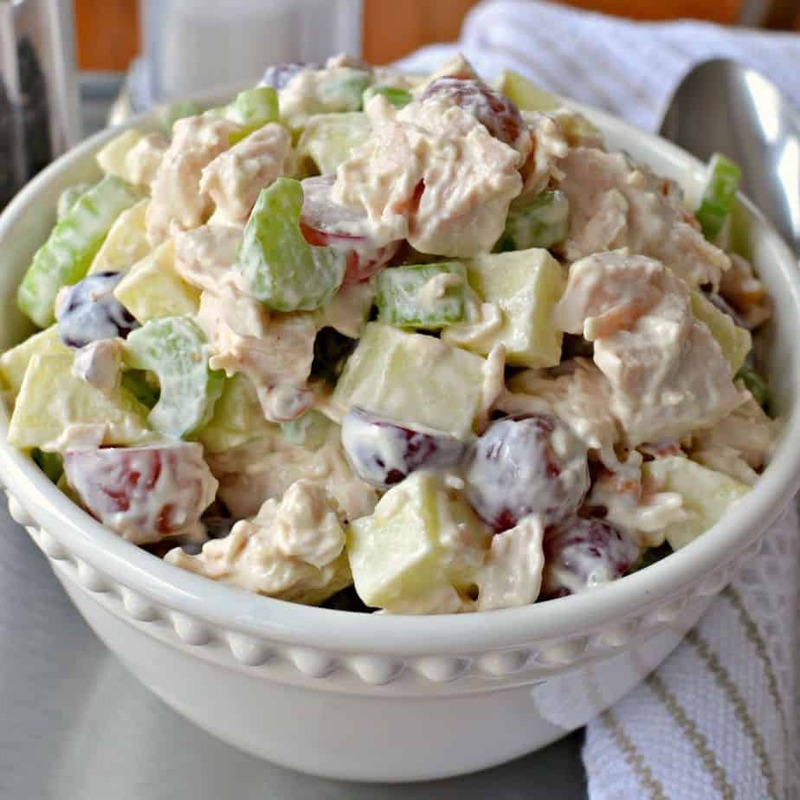 This delectable recipe is one of our favorite chicken salad recipes. You can serve on a bed of spring greens, stuffed in a sun ripened tomato, or stuffed in a whole wheat pita. Have you ever tried Waldorf Salad? It is so scrumptious, easy, quick to come together and fancy enough for company. This delectable Chicken Waldorf Salad comes together in about ten to fifteen minutes. This recipe calls for already cooked rotisserie chicken which can be purchased at almost any grocery store or club warehouse like Costco and Sams. How do you make Chicken Waldorf Salad? First grab a big bowl for mixing, Cut the chicken, celery and grapes. Toast the walnuts in the oven for about five to seven minutes. Cut the apples and toss with the lemon juice in the bowl. Add the chicken, celery, grapes, toasted walnuts and mayo to the bowl and stir to combine. Add salt and pepper to taste. Serve over leaf lettuce or a thin bed of spring greens. Variations for Chicken Waldorf Salad. Don’t like walnuts or have them on hand. Use toasted pecans or sliced or slivered toasted almonds. 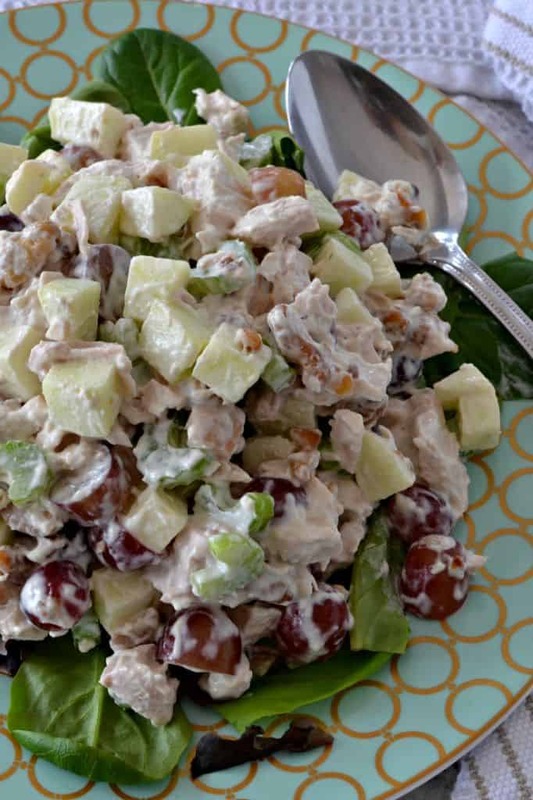 Are you looking for a lighter version of Chicken Waldorf Salad? Substitute half of the mayo with non fat Greek yogurt. Want to dress it up even a little more. Add one half cup dried cranberries or dried cherries. Do you want to sweeten it up a little bit? Add two tablespoons of honey. Want to make a sandwich with the chicken salad? It is delicious on pumpernickel, rye or European whole grain. You can sub seedless green grapes for the seedless red grapes. You can use any kind of crisp apple like Granny Smith, Cripps Sweet, Fuji, Honeycrisp or Gala. Can you substitute poached chicken in Chicken Waldorf Salad? Yes you most certainly can. In fact several Waldorf Salad recipes call for poached chicken. Simply add a couple of chicken breasts to a pot, cover up halfway with chicken broth, add parsley, a small stalk of celery and a little piece of onion, and a clove of garlic. Bring to a boil then turn to simmer. Simmer uncovered for five minutes. Remove from heat and cover for fifteen minutes. Now remove the breasts from the chicken broth and you can cube or shred the chicken and use in the salad. This amazing Chicken Waldorf Salad is easy, quick to fix, delectable and dependable. Put the ingredients on your shopping list today and let me know what you think! Other favorite chicken recipes you will love! 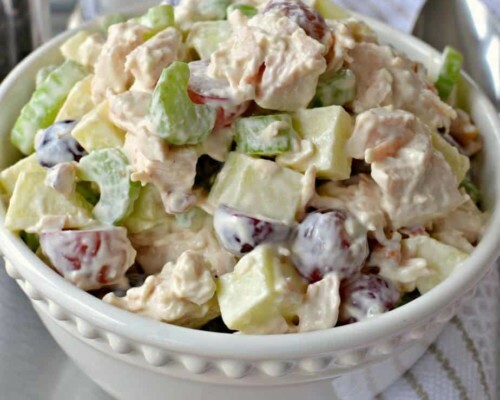 This delectable family favorite Chicken Waldorf Salad is tender chunks of chicken mixed with celery, grapes, apples, toasted walnuts and mayonnaise. In bowl combine apple and lemon juice. Add chicken, celery, grapes, toasted walnuts and mayonnaise. Stir to combine. Salt and pepper to taste. Serve on bed of spring greens or leaf lettuce. “Two stacks” of celery – please explain. Is that to stalks? Thanks for the heads up Roshelle! It is stalks. I am going to correct right now. Small puppy in the house has everything turned upside down. Can the celery be replaced with something else? I am sure you could replace with green pepper or small chopped broccoli. This looks yummy, tasty. I am pinning it so that I can make it on Sunday. Thanks so much Monidipa. We love it so I hope you enjoy it as much as we do! 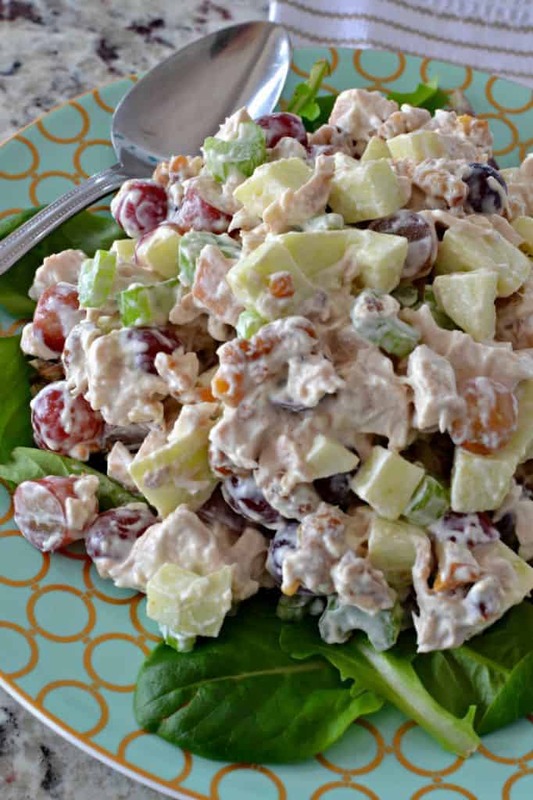 Waldorf salad is one of my favorite things to serve my family. It’s a complete meal in and of itself, which means I save time and I get something super tasty on the table. This looks so delicious. Love that there are granny smith apples in there. Would be so good on a pumpernickel bagel. That sounds absolutely amazing! Delicious! Oh I love chicken waldorf. I was introduced to it when I worked at a European deli when I was younger. Your recipe sounds perfect. I’m not sure I’ve ever tried this before. I don’t eat meat and I’m not a huge fan of fruit and mayo together. Yum! My mom used to make this and I haven’t had it in years. Thanks for the idea. My pleasure Katie! I hope you enjoy it! my boyfriend is a huge lover of chicken salad. this sounds absolutely perfect for him! This is so good, I’ve made a similar recipe and it’s definitely a favorite at our house. I really love chicken waldorf salad but haven’t made it for a while. I’ll be trying out your recipe, it looks great. You can not beat a good salad, with Spring now officially here I’ll be eati more of these. This sounds like a quick and easy salad that can really be a whole meal. That is a super easy delicious recipe! Enjoy! Yum this looks incredible! I’m definitely making this salad next week! This recipe looks yummy. I would love to taste it. Omg can we say yum?!?! I just love making any kind of salad that involves chicken. Must make!!! This chicken waldorf salad look delicious! Great for on a crackers a light lunch for sure! My moms was used to make this for us very often a winner in the weekly menu for sure and a classic for springtime meals. Loving all your pics, the salad looks fantastic. This is a gorgeous sounding recipe! I’m a big fan of Waldorf Salad, but your addition of chicken makes it a perfect meal on its own. Yum! Thanks Elizabeth! I hope you enjoy it! I never heard of a waldorf salad before. I will definitely be giving this a try!